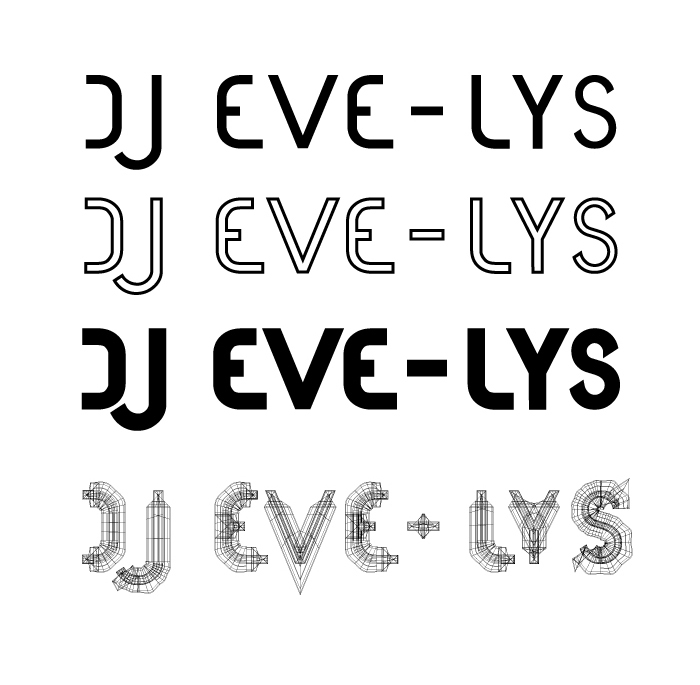 Working on acrylique, Eve asked two weeks ago if I could also manage a font for her name: dj EVE-LYS or DJ EVE-LYS. I’ve already updated my post about acrylique with the new font. The first line, on the image below, is the reference. Then, I thought it won’t fit everything, even changing color for better integration on backgrounds or on other more complex stuff. So I made also an outlined and bold version. And… at the end, I tried a quick 3D exploration, something simple… and I came with the fourth line. The second visual is a quick test on my choices, illustrating one Eve’s track I love so much: “entends tu pousser les fleur”, which means “do you hear flowers growing”. I would love to have it on vinyl, to mix it with my favorite ambient LPs. So I do hope it will decide Eve to press it. As you can see, I didn’t put the title, even which vinyl side it is. For me, it has to be a “B side”, to stay as pure and minimal as possible.